Decoding Eurozone “deflation” from a mysterious demon to products people touch each day finds deflation not so widespread, not always unique to the Eurozone, and difficult to fix for the European Central Bank’s (ECB) latest asset purchase program. It might be easy to pump air into a leaky tire, but trying to drive fast on an inflated, yet bald tire might just make a skid mark. For the Eurozone, Harmonised Indices of Consumer Prices (HICP) are provided by European Commission Eurostat for geographic areas and products. 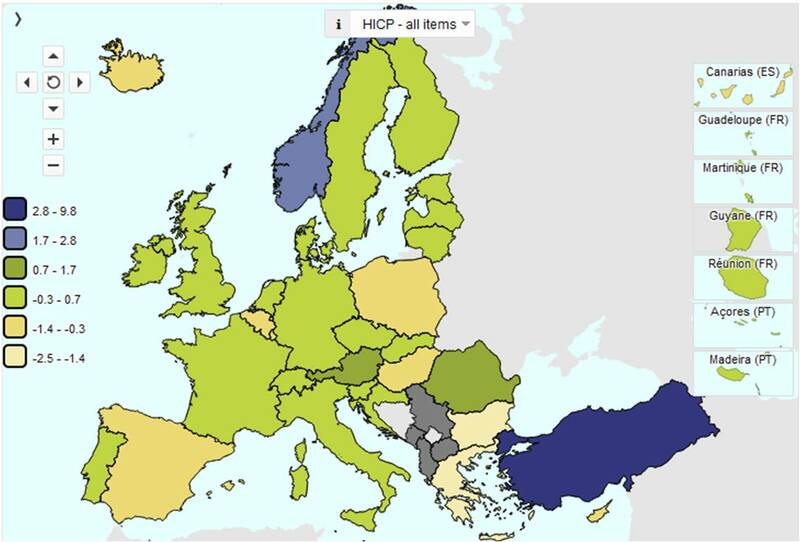 Eurostat animates this map at http://ec.europa.eu/eurostat/web/hicp and combines price changes with weights by component at http://ec.europa.eu/eurostat/web/hicp/inflation-illustrated. Using our approach from Better investing by better understanding sources of inflation, June 2014, it helps to picture prices by product groups. In the product group view, to avoid seasonal squiggles obscuring a graph, items such as clothing, recreation and culture, restaurants and hotels are first removed. Also for clarity, most energy-related items are removed. Back to these later. To read the picture, realize that each category is shown as an index with a 2005=100. 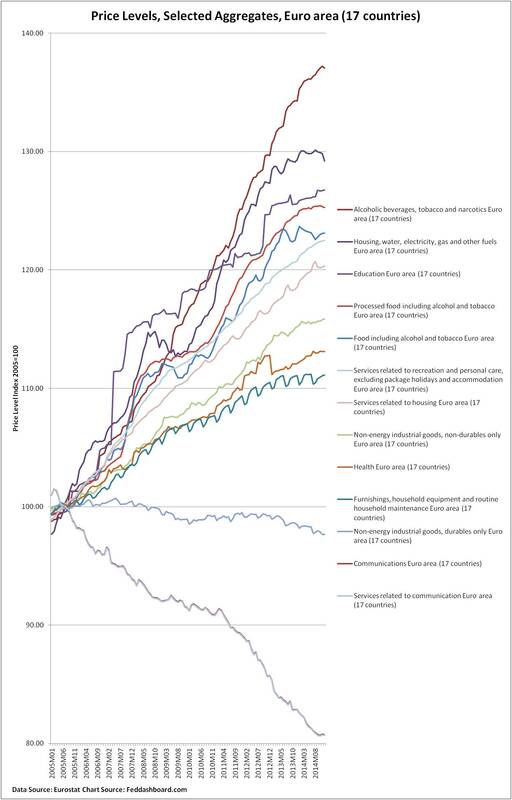 As the data also starts with 2005, if the most recent data point is just below the 120 grid line, bang, that’s about the 2% annual inflation target. In short, lower prices for these groups are mostly about globalization, technology and government policy. Monetary policy doesn’t change the causes. Mostly, monetary policy can increase prices by devaluing the Euro so imports are more expensive as measured in the Euro. Yet, this cuts purchase quantity on more price-sensitive imports. Several groups including energy are shown – liquid fuel plummets. 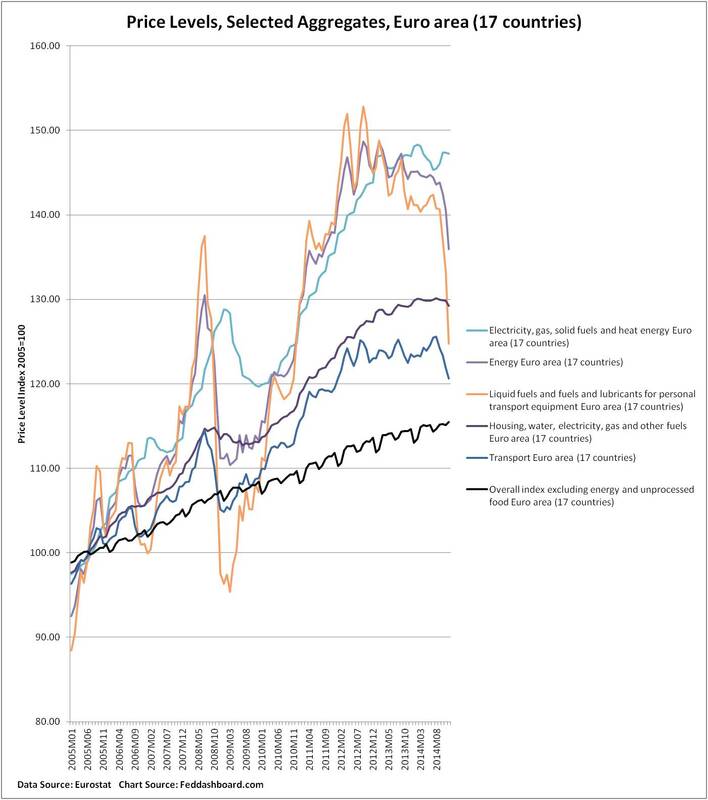 Overall index excluding energy and unprocessed foods (black line) has a price increase of over 1.5% per year, although the rate of price increase has slowed since late summer 2012. Clothing and footwear index is up just 1% since summer 2012 with decreasing monthly y/y increases. Yet, the Euro area is significantly higher than the 1% drop in U.S. CPI-U Apparel. Recreation and Culture came out of the recession with prices increasing to a spike of over 2% in early 2013, since then price increases tempered to a flat 2014 similar to the 2006-2007 experience. Restaurant and Hotels prices had been rising since 2010 at about 2% and then slowed at the beginning of 2014 to rises of just over 1.5%. In each of these products, specific market segments have different dynamics. Those segments more price-sensitive to imports will see purchase quantities fall. It’s tempting to compare EU and US overall price indices, and then point to differences. Yet, this misses contrasts in government policy in broad structural areas and specific industries. Of course, behind each structural reform (labor, trade, price controls, business climate or tax) is a question of government and popular will to reduce economic protections for some groups so the economic pie can grow for all. While there are several theories about how such monetary policy will unfold, the emphasis of Mr. Draghi’s statement seems to be the hope that buyers will see rising inflation and spend today rather than tomorrow — even in the face of needed “balance sheet adjustments” and uncertainty. Buyers today have adjusted to shopping with different price trends — housing is climbing while big TVs falling. The assumed “anchoring” may no longer work as it did in the past. Historically, “easy money” created inflation when too much money chased too few goods. No shortages today, as Mr. Draghi also noted. Spending and investment happens in response to catalysts of confidence. An open behavioral question is whether people will view monetary action as a catalyst of confidence or sign of desperation. Thus, importing inflation through devaluation seems the most likely monetary outcome. Equities and corporate debt are likely to rise. For Euro area companies, dangers lie in coping with distortions. For example, those for companies that buy inputs globally for local sale, or whether losses from devaluation will be offset by gains from exports and financial asset price increases. For companies outside the Euro area, investors will need to consider effects on exports to Euro area and earnings conversion. For any product, buyer price sensitivity is important. Further distortions and market shocks such as the current crisis with Greece will exacerbate the issue of spurring growth or avoiding deflation. Given limits of quantitative easing and need for structural reforms, watching for warning signs of distortions is the priority. For investors, it is particularly important to watch for bubbly financial asset prices becoming a eurozone bald tire skid mark.